This gluten free meringue cookies recipe is one you want to be sure to add to your collection. MAKES 42 (1-1/2-INCH) COOKIES If you don’t have superfine sugar, use regular granulated sugar whirled in a food processor for 1 minute. Be sure to use alcohol-based extract; oil-based deflates the meringue. For visual flair, try a variety of pastry tips and piping techniques and, after baking and cooling, dip the cookies in chocolate or sprinkle them with edible gold dust (see below). Cookies keep in an airtight container at room temperature for 1 week. Preheat the oven to 200°F. Line an 18 by 13-inch baking sheet with parchment paper. Fit a large piping bag with a large star tip and set aside. In the very clean bowl (no residue or grease) of a stand mixer, beat the egg whites with the whisk attachment until foamy with soft peaks that form and immediately fall into themselves. Turn off the mixer, add the cream of tartar, then turn the mixer to medium-high and add 1 tablespoon sugar at a time, mixing it in completely before adding more. When all the sugar is mixed in and the meringue is glossy and stiff, mix in the almond extract 1/4 teaspoon at a time, mixing between each addition, until incorporated. Stop the mixer and rub some of the meringue between your fingertips; if it’s very gritty, mix on medium-high for 1 minute longer. Using a rubber spatula, scrape the meringue into the piping bag. Holding the top of the bag with one hand, twist the bag to seal the top. Hold the piping bag at a 90-degree angle about 1/2 inch from the prepared baking sheet and pipe stars 1 to 2 inches in diameter close together but without touching (they won’t spread when they bake). Bake until the cookies are very firm to the touch and effortlessly release from the parchment paper, about 1-1/2 hours, rotating the pan halfway through. Turn off the oven, return the baking sheet to the oven, and let it cool with the door ajar for at least 1 hour or up to overnight. 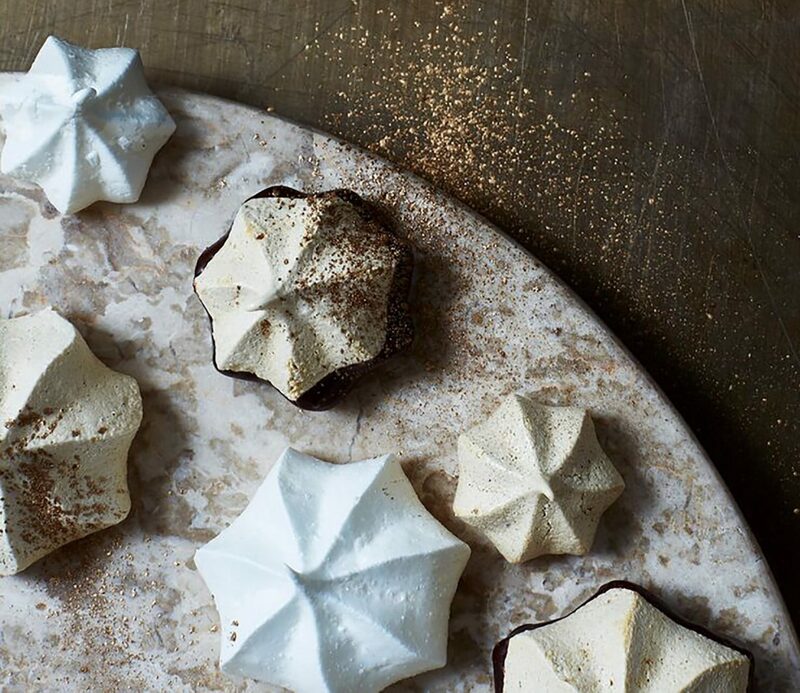 For Cappuccino Meringue Cookies: Swap the almond extract for 2½ teaspoons instant espresso powder crushed into a fine powder and ½ teaspoon pure vanilla extract. For Gilded Cookies: Sprinkle cooled cookies with edible gold dust (available at craft stores). For Chocolate-Dipped Cookies: Melt small pieces of dark chocolate in a double boiler, stirring until smooth, then immediately remove it from the heat and dip part of each baked and cooled cookie into the chocolate. Let them harden on a parchment paper–lined tray.